What's New at Your CU? April 3rd, 2019 - Easter Hats and an Easter egg hunt at gTKY! April is National Credit Union Youth Month and one of the things we did to celebrate was host an Easter Egg Hunt! 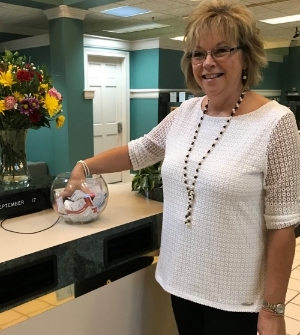 Both branches hid Easter Eggs, filled with candy, cash, and toys, around the lobby and invited the community in to have some fun and talk about the importance of children learning to save. We had a great time with those who came out to hunt and had the great opportunity to see some new faces in the Credit Union! The GTKY staff also had some of their own fun with a Easter Bonnet Contest! Each staff member received a hat to decorate however they wanted, and we ended up with some really cool designs! The staff all voted on the winners of the contest and had a blast with it! Check out some our pictures to see some of our hats! March 1st, 2019 - Access Your GTKY Online Banking through quicken® and mint®! Do you use Quicken® or Mint® to help manage your finances from one place? GTKY now offers CU 24/7 Online Services through Quicken and Mint! Downloading your Credit Union account information directly to Quicken lets you manage your personal and household finances quickly and easily without manually entering each purchase or deposit. With Quicken, you can forecast your cash flow, get instant insights into your spending, create and follow a budget, and save more money! You can visit the Quicken website to learn more and download the software. Mint brings together everything from balances and bills to your credit score and more! Mint is simple and free to set up, taking just minutes to link all of your accounts in one place. With Mint, you can track your bills, create a budget, view your credit score, set account alerts, and track your investments! Visit the Mint website for more information, or download the app for free from the App Store or Google Play. In an effort to better serve our membership, we have invested in new Online and Mobile Banking technology to make banking easier and more convenient than ever for you. With this new Online and Mobile Banking Platform, members are able to have a better user experience while enjoying some new products and services, like the ability to transfer to and from accounts you own at other institutions, an improved Bill Pay system, remote check deposits, and more! Want to learn more about the new Online and Mobile banking? Check out our Online and Mobile Banking Conversion page, filled with information and tutorial videos! Haven’t had the chance to login or enroll for Online Banking? Visit our Online Banking page now! After the end of the year, it was time to collect all 35 piggy banks from all of the wonderful local businesses we partnered with for the Gift of Change donation drive to tally up our total. Thanks to the generosity of Central Kentuckians this past Christmas season, we were able to raise over $500 for the Make-A-Wish Foundation, all from spare change! Thank you to everyone who supported this donation drive and took the time to spare some change. We also want to thank Faith Hacker, the Senior Development Director for Make-A-Wish Ohio, Kentucky, and Indiana, for helping us pull this all together. Visit our Gift of Change page to learn more about our donation drive. Remember to keep an eye out for more community events coming up next year! Follow us on Facebook to see what we’re up to. November 29th, 2018 - Delivery day! Last Thursday, we had the opportunity to deliver several more adorable piggy banks to local shops in Lexington! Check out our photos above to see where you can find these piggy banks in town! This Monday, we went out to one of our participating shops, Old Kentucky Chocolates in Hamburg, and talked with LEX18's Lee Cruse about the Gift of Change Donation drive, our partnership with SCAPA, and the great impact Make-A-Wish has on children's lives everywhere. We were even joined by our newest friend, Finn, a local wish child, and tasted some really yummy samples! Hot tip: Their chocolate covered grapes are amazing! You can stop by their location today to pickup some chocolate and check out our cute reindeer piggy bank while you're there! We had a wonderful opportunity to talk to FOX56 about the Gift of Change donation drive and spread the word about the work that Make-A-Wish does for children in our community. Check out our interview above and come by one of our participating shops to help make children's dreams come true! This past Thursday, we had an amazing opportunity to join Faith Hacker, the Senior Development Director for Make-A-Wish Ohio, Kentucky, and Indiana, and Hannah, a former Make-A-Wish child, at SCAPA to talk to our artists about the organization that they'll be supporting through the Gift of Change donation drive. We had a wonderful time getting to know the students, teaching them about the work Make-A-Wish does, and hearing about their own experiences. Thanks to wonderful support of Mrs. Adamson and Mrs. Barker, organizing this event has been a pleasure for us. We're excited to join forces for a great cause and to share the beautiful work their students do with the community! Check out our video above to see some pictures from the presentation! This past Thursday, we went to Common Grounds Coffee House to spread the word about our FREE Kasasa Checking Accounts and some free coffee while we were at it! Thanks to some help from Kasasa, we were able to give away 65 coupons for $7.50 off of customers' purchases! We wanted to show people that they don't have to pay a fee every month to bank somewhere and that they could be earning this $7.50 every month, just for banking with Greater Kentucky Credit Union! We had an absolute blast at the Fayette County Fair this year! 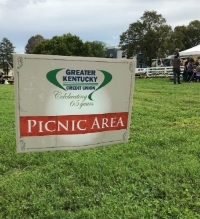 We were honored to be the OFFICIAL CREDIT UNION of the event and have the opportunity to participate in such a fun, family event. We had a couple of tents setup with games, giveaways, and tons of useful information for everyone who came by. Not only did we get to enjoy the nice day and great company, but we also raffled off a 50" VIZIO FLAT SCREEN TELEVISION to benefit Central Kentucky Riding for Hope! Tickets were $5 each and we had a lot of folks interested in taking that TV home. After the event was all said and done, our President and CEO drew for our winner. Congratulations CHARLES FORKER!! Thanks to the support of Charles and everyone else who entered, we were able to donate all of the funds collected directly to Central Kentucky Riding for Hope. Central Kentucky Riding for Hope is a local Lexington organization that provides therapy to those with special needs through horses. They touch so many lives every day with their amazing work, so we were just elated to be able to give any amount. Thank you Jessica, a representative from Central Kentucky Riding for Hope, for coming by to meet us all and take a picture with us to capture this moment. We're very excited for the future of the Fayette County Fair and can't wait to see what the event will be like next year. It grows more and more every year, so make sure to go next September! Want to learn more about Central Kentucky Riding for Hope, their mission, and how you can help? Click here!